To be married here, one of you needs to be a parishioner of Our Lady and St Anne’s. This means that either you live within the parish boundaries or you come to Mass here most Sundays. You need to be free to marry in a Catholic church. This generally means that neither of you should have been married before, either in a church or in a registry office. Depending on your circumstances, you may opt to be married during a Nuptial Mass or in a marriage celebration without Mass. This should be discussed with Fr Patrick. 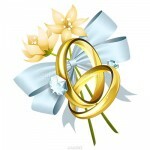 Before any wedding can be arranged, there is a lot of paperwork and other details to be prepared. This is why plenty of notice needs to be given, so please approach Fr Patrick as soon as possible after your decision to marry has been made.